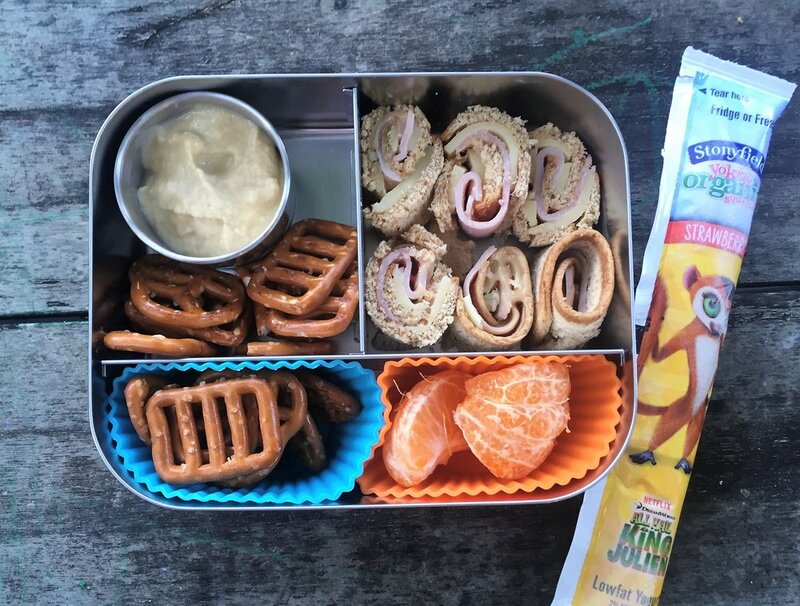 7 Tips for Quick, Healthy School Lunches! Each year summer seems to go faster than the last….and no matter how you feel about it, it’s that time of year again! Stores are selling back to school clothes, end caps of Target are brimming with crisp folders, marker boxes, and fresh pens and pencils, the kids are asking for new shoes and backpacks, and you’re feeling fired up and strong going in to the start of a new school year. You’re really going to nail it this time, join the committees, complete all the paperwork, volunteer to make homemade treats for the parties. Or maybe you’ve done this many times and know that won’t be you this year. Either way, there’s one fact that won’t change – the kids have to eat! And unless your child buys at school, that means that you’re going to be packing a lot of lunches. In my case, it’s 2 or 3 lunches each weekday, and I don’t even want to think about the math on that for total number of lunches to be packed this year. But the good news is, it doesn’t have to be time consuming or stressful or even the same old boring sandwich every day. Here’s my tips for making it as enjoyable (or at least as painless!) as possible! 1) Get the kids involved. Depending on their age, it can be as simple as letting them pick which fruit, snacks, etc. you throw in the cart that week at the grocery. Older kids can pack some or all of their own lunch. It’s good for them to have the responsibility, and they’re more likely to pack things they’ll actually eat. 2) Arm yourself with a few trusted supplies. Brown bags are easy and economical. I get it, no muss, no fuss. I remember when I was little, the thing was to decorate your brown bag with marker for the ultimate personalized experience. But there are lots of great container and lunchbox options out there these days that can make the job easier and save you having to pack everything into Ziploc bags. Some of these lunchboxes are a little pricey upfront, but they can last for years and stand up to a good beating. For instance, we have a Planetbox container/bag combo (currently on sale!) that is going on it’s third year and is as good as new. The compartments make it easy to add in a variety of food and the bonus is that you don’t have to panic because you ran out of baggies again – or is that just me?! (Also, these lunchboxes make everything look pretty and delicious and organized which I swear somehow makes this whole process more enjoyable.) The metal container sections are ideal for packing foods without smushing them, i.e. sliced fruit and veggies or cheese and crackers, and there are small containers that fit within the compartments and can be used for things like yogurt or dipping sauces like hummus or salsa. There are other stainless-steel brands out there, i.e. Lunchbots and U-Konserve, plus bento style boxes like YumBox and Bentgo. The plastic Ziploc brand divided lunch containers (or similar) will get the job done and are less expensive even if they may not hold up as well long term. Disclaimer: my oldest prefers a plain lunch bag like his friends. We use one called the Fridge to Go bag. If this is the case for you, I recommend a few reusable plastic or stainless steel containers of various sizes that you can put food in, as pictured below. This makes for less waste and is also easier for packing foods that may get smashed easily. 3) Make leftovers your friend! This is one of my favorite hacks because you’re not reinventing the wheel here folks. Slice up a leftover grilled chicken breast, fill a container with pasta, or reheat some soup. (Note: for warm items like soup, I love the small Thermos containers.) Leftover taco or burrito filling can be mixed with rice and cheese or rolled up in a tortilla. Had pizza last night? They just won the lunchtime lottery. Also, it’s not just dinner that has leftovers. If you made oatmeal for breakfast, toss that in a thermos with some blueberries. Didn’t finish their scrambled eggs? Wrap them into a tortilla or pita with shredded cheese. 4) Use sneaky sandwich subs: Tortillas, bagels and pita bread can be your friend here when you are sick of sandwiches! Slather a tortilla with hummus, honey mustard and veggies, or load up a whole wheat bagel with cream cheese and turkey. I’ve used leftover whole wheat pancakes from the weekend to make sunbutter and or cream cheese and jelly sandwiches. Or think outside the bun completely and shove some meat, veggies, and cheese on a few long toothpicks. It looks fancy and is just as fast as a sandwich. I buy Amy’s brand frozen veggie burgers to heat up and add to a bun or tortilla. Finally, even changing the shape of the bread can make it seem different. Take one minute to roll the bread flat, add your toppings, and roll it up to make pinwheels. This takes literally one additional minute. Maybe. 5) Choose healthier packaged snacks: When buying packaged snacks (i.e. chips, crackers, cookies), I look for those with fewest ingredients, no artificial colors, and least amount of sugar. There are plenty of good options these days, and although some people choose to buy no packaged snacks, I can tell you in my realistic world, it’s helpful to have a few good options on hand that you know your family likes! Popcorn, tortilla chips (+ salsa), whole grain pretzels and crackers, and veggie straws or plantain chips (+ guac) are some of ours. 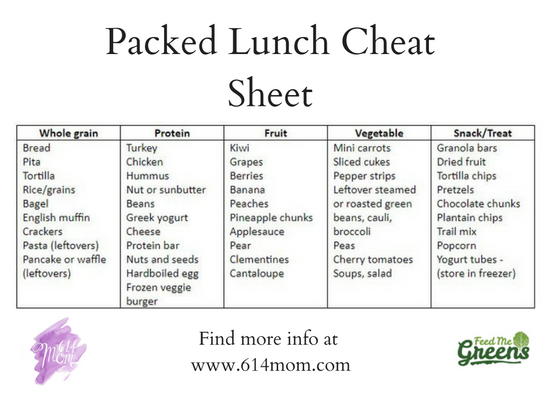 6) Packed Lunch Cheat Sheet: I pack lunches with these categories loosely in mind. Just some examples to get your wheels turning! 7) Finally! Don’t put pressure on yourself to have every lunch every day be healthy and delicious and Pinterest worthy. I try to aim for mostly healthy but they definitely get Pirate’s Booty and cookies sometimes and other times it’s homemade protein bites. Remember that they have someone who loves them enough to think about their lunch so they’re lucky and blessed before they even open that box or bag! Erin Wanke spent 8 years working in clinical research before leaving to complete her health coach certification through the Institute of Integrative Nutrition. She now runs a health coaching business, publishes a vegetarian food and wellness blog (Feed Me Greens), and provides recipe development and food photography services. Erin lives in Columbus, OH with her husband and three young children/sous chefs/mess makers. You can find more information on her website at www.feedmegreens.com, or follow her on Instagram (feed_me_greens)!